Spurred on by the red jersey on his back, thoughts of overall victory and most of all the memory of his late father, Robert Gesink today pulled off the best time trial of his career to win the race against the clock in the Tour of Oman. 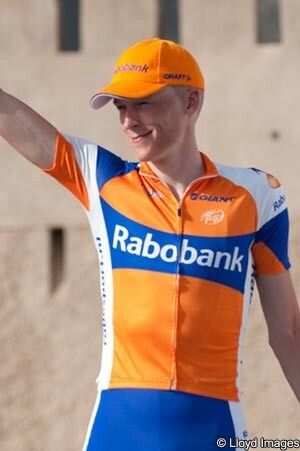 Benefiting from a tough course which made things difficult for the pure specialists, the 24 year old Dutchman scorched over the 18.5 kilometre course at Al Jissah, beating Italian road race champion Giovanni Visconti (Farnese Vini - Neri Sottoli) by sixteen seconds and Italian time trial title holder Marco Pinotti (HTC-Highroad) by eight more. The quality of his performance was underlined by the 27 and 29 seconds he put into world champion Fabian Cancellara (Leopard Trek) and last year’s TT winner Edvald Boasson Hagen (Sky Procycling), respectively. Tour of Qatar prologue victor Lars Boom (Rabobank) was eighth with American Christian Vande Velde (Team Garmin-Cervelo) netting a solid tenth. “It’s a really big surprise to have won the time-trial,” Gesink admitted, speaking of the moment when his Grand Tour prospects took a major leap forward. “When I took off on the course, my goal was to try and keep the red jersey. To win a time-trial is a huge surprise but the course was very difficult and suited me. The fact that we were on normal bikes helped me. Undoubtedly aided by the climbs on the course, Gesink ends the day a full one minute and 13 seconds ahead of Boasson Hagen, and a further six ahead of Visconti. Michael Albasini (HTC-Highroad) is fourth, one minute 52 seconds back, while Vande Velde (Team Garmin-Cervelo) is two minutes and four seconds back in fifth place. The 2.1-ranked race concludes tomorrow with a 157 kilometre road race stage from Qurayyat to Mattrah Seafront. It is lumpy early on but has a completely flat second half, and seems tailor-made for a big bunch sprint. With two stage wins in the bag plus a comfortable advantage over all of his main rivals, Gesink appears to be on course for the biggest stage race victory of his career.